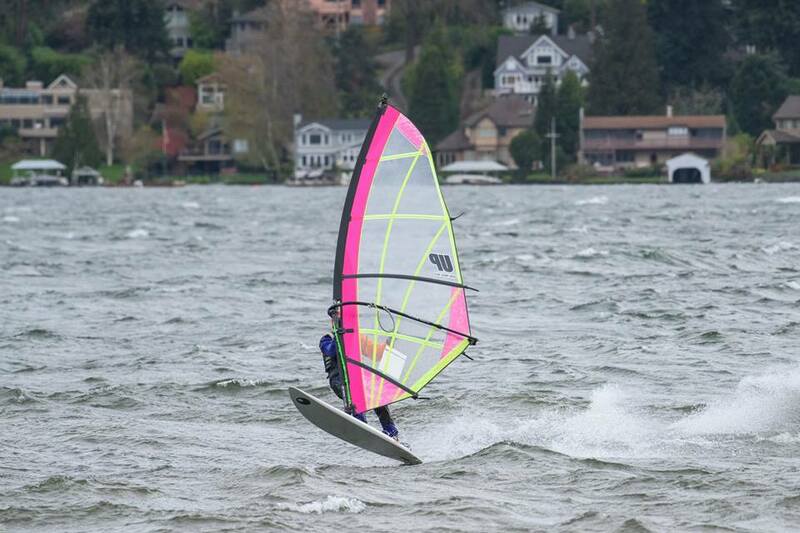 Friday April 7th was a rare and very windy day for much of the Pacific NorthWest. Of course, the Gorge is famous for having high wind in the summer. But in Western WA and the greater Seattle area, we only get really windy days when occasional winter storms roll through. The local meteorologists were all chatting away on Thursday the 6th, and Friday morning, about how rare it was to get such a deep low pressure center in the area at this time of year. The forecasts were correct, and we had blustery wind all day! The wind was very gusty, up and down all day, approx 20-40 mph wind speeds. So if you rigged for 30, you loved it some of the time, and were very challenged other times! It’s always like that when it’s really windy here. We had a good crowd at Newcastle Beach Park, on the SE side of Lake Washington with sailors, coming and going from early ’til late. John M. gets the ironman award, as the first one to arrive and the last one to leave. And he was on the water for a lot of that time, so he definitely sailed the most! We had many Newcastle regulars, and a few who only show up on the big days. And we had “the Adam bros.” Two young guys (by young, I mean, in their 20s) that are friends, and yes, both named Adam! 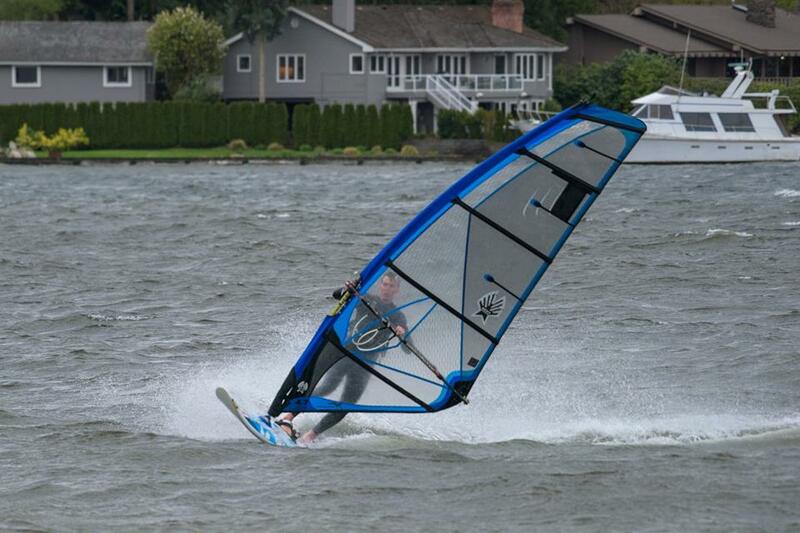 Adam #1 has only sailed a year or so and he was working on waterstarts. Adam #2 (who has sailed the Gorge for many years with his family) was possibly the best sailor there, making big jumps, sweet jibes, and riding the big swells in the middle of the channel (they were very big at times, for the Lake!). I (200 lbs) rigged 2 sails and 2 boards, and had ’em all down at the beach. 4.5M and 5.5M sails. 85L and 103L boards. And throughout the day, I used each of the 4 possible combinations I could! As the wind varied, I would try to match it with the right combo – sometimes I guessed right, and sometimes I was wrong! But I was patient and had lots of good rides. 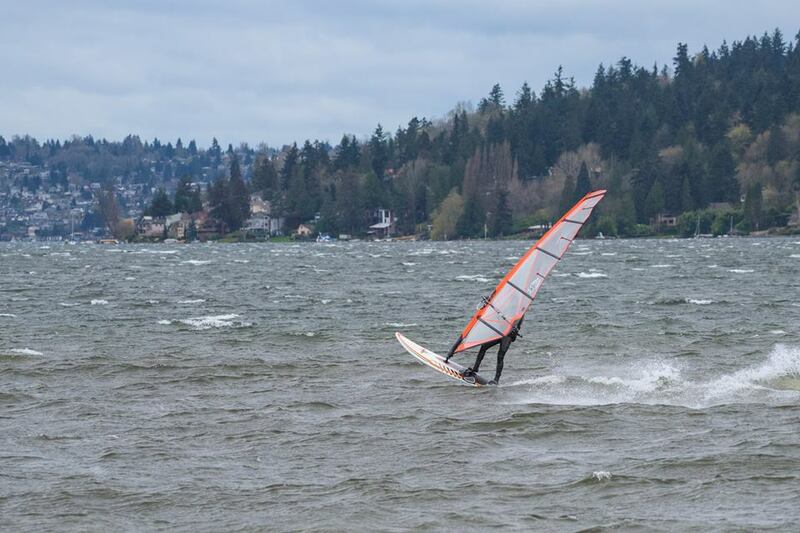 The water is of course still very cold in Lake Washington, and it will be ’til June. However, this day was great ’cause the air temp was really warm for early April: mid to upper 50s! And there was almost no rain! These days do happen from time to time, here and at other places. But it was very cool to get some great pics from this day! 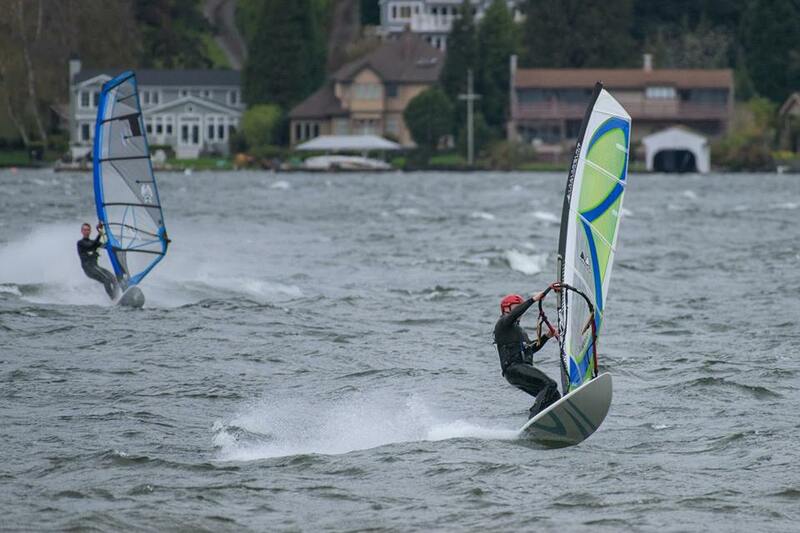 Big thanks to local windsurfer Dan Taylor / Destination360 for the professional pictures! Next story Skid marks on the course! Previous story WaterSpotr – where are your buddies sailing today?